Location: Basey, Samar, some 3 hours (45 min to 1 hr by land and a 2-hr boat ride) from Tacloban City. 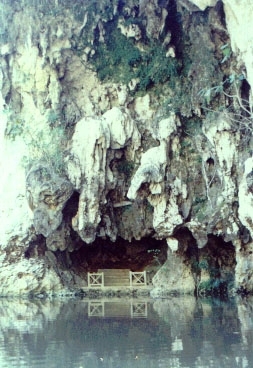 Caves, a subterranean river, waterfall, unique limestone formations and a picnic grove. The cave entrances are found on the faces of towering and rugged cliffs. Traces of early habitation date back to the Stone Age which were believed to have been used as burial sites. A magnificent natural stone bridge over the Sohoton river crowns the site. Lush forests covering the hills are home to a variety of exotic wildlife including colorful birds and rare mammals. Now a national park, Sohoton in one of the more popular destinations in the region. Calbiga Caves Location: Samar Province, some 52 kms from Tacloban including a 6-km trek (can be traversed by a 4x4) of rough road from the national highway to the cave. The site holds the biggest karst formations and is perhaps the largest cave in Southeast Asia. The estimated 2,968-hectare cave system composed of 12 main divisions is home to exotic and endangered specie of bats, crickets and eyeless fish. The caves lie beneath hills of thick forests and is largely unexplored. The main cave, Langun, has a chamber that could easily fit in three football fields. Warning! It's easy to get lost in its caverns. Bring a guide. And don't leave anything behind you after you get out! Binaliw Isle In Calbayog City, Samar; a divers haven. White beaches, unspoilt environment. Nice hideaway. The 40-50 meter deep waters surrounding the island are home to multifarious coral and teeming sea-life. Bring your own snorkeling or diving gear! 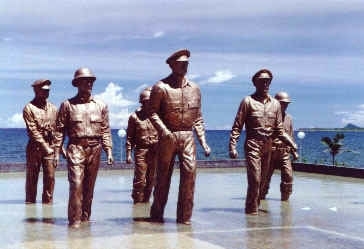 The Eternal Flame of Peace (above) and the larger-than-life bronze statues of MacArthur and his entourage. McArthur Memorial National Park Red Beach, Palo, Leyte. Czech President Vaclav Havel, during a visit to the site, stood atop the concrete breakwater behind the park and said "This is the most beautiful gulf in the world!" 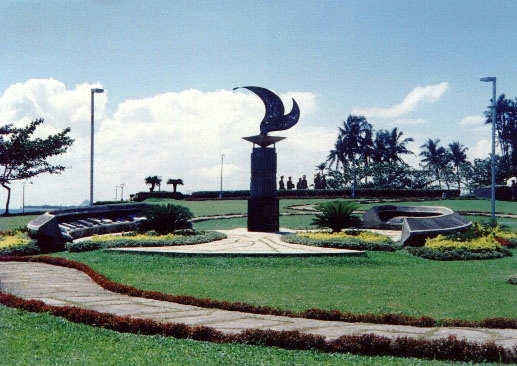 Built to commemorate the Red Beach landings of the Allied forces in Leyte on October 25, 1944, this park is one of the best maintained parks in country (believe me, I've seen others). No wonder it is a favorite of Leyte�os. The bronze sculpture of the Flame is surrounded by rocks indigenous to 20 different countries and known as the Rock Garden of Peace. These slabs of rock are respectively engraved with messages of peace from its originating country. Messages range from the bland quotes of UK's Queen Elizabeth, the highly emotional lines of US President Bill Clinton, to the short, simple and direct message of the Japanese: "Eternal Peace"